This Greek style yogurt chicken recipe is not only simple, it’s moist, it’s flavorful, and it only takes 25 minutes to prepare. We recommend preparing the chicken one day in advance of roasting it, so it can fully soak in the yogurt sauce. 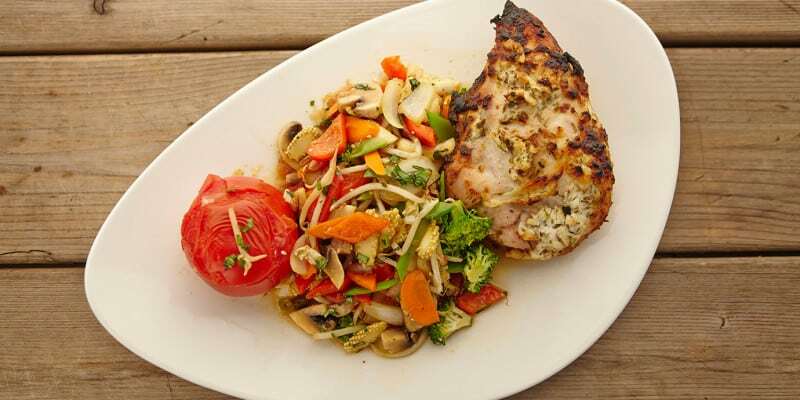 This chicken serves a great main with salad, veggies, rice, or anything you choose. We like it as pictured above. Check out the perfect pairings: Vegetable Stir Fry and Stuffed Tomatoes! Wash the chicken and place in a mixing bowl. Chop the onion and herbs, and combine with the chicken. Add yogurt, salt and pepper, and mix all the ingredients together. Preheat the oven to 400ºF. Put the chicken on a baking tray and drizzle with olive oil. Roast for about 20 minutes or until the internal temperature reaches 160ºF to 165ºF. Before cutting the chicken, let it sit for 5 minutes. Then cut, serve, and enjoy!